Perfect for leftover fruits, salad, veg and bread. Mix and match what you have. Preheat oven to 200°C/180°fan/Gas 6. Fry chorizo and chicken chunks in olive oil for about 7 minutes, until chicken is just cooked. 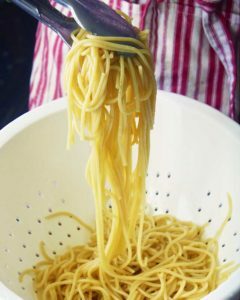 2 Add flour and cook for 1 minute, stirring, then pour in stock, stirring continuously for a further minute. Stir in cream and sweetcorn, season to taste and spoon mixture into a pie dish. 3 Brush dish rim with water then cover with pastry. Trim and crimp edges and use trimmings for decorations. Brush with egg. 4 Stand pie dish on a baking sheet and bake for 25-30 minutes until pastry is puffed and golden. Cut pie into wedges and serve immediately with green vegetables, if wished.